Yokoten is a Japanese word that roughly translates to “best practice sharing”. Yokoten, the term Toyota adopted to capture the idea of horizontal transfer of information and knowledge across an organization. It is one of the winning behaviors of Toyota, namely copying and improving on kaizen idea that works. Toyota calls this yokoten since it’s more precise than “copy” or “horizontal deployment” or “sideways expansion”. It’s not a vertical (top-down) requirement to copy as Intel might deploy it in their “copy exactly” model. It’s not a “best practices” or benchmarking approach per se. Yokoten is horizontal, or more peer-to-peer, with the expectation that people will go & see it for themselves (this is called genchi gembutsu) and learn how another area did kaizen. In yokoten at Toyota there is an expectation that copying a good idea will be followed by some added kaizen to that idea. How yokoten is done at Toyota? Rather than waiting for the kaizen information to go up the chain of command where it can be sent back down to another area to copy or learn from, Toyota people are encouraged to go see for themselves, and return to their own area to add their own wisdom and ideas to the knowledge they gained. Simply telling subordinates to copy it may be kaizen of a sort but it would not serve the second important aspect of the Toyota Production System, the respect for and development of people. Within the 8 step practical problem solving process known as TBP (Toyota Business Practice) the yokoten activity happens in step 8. How can we adopt it? 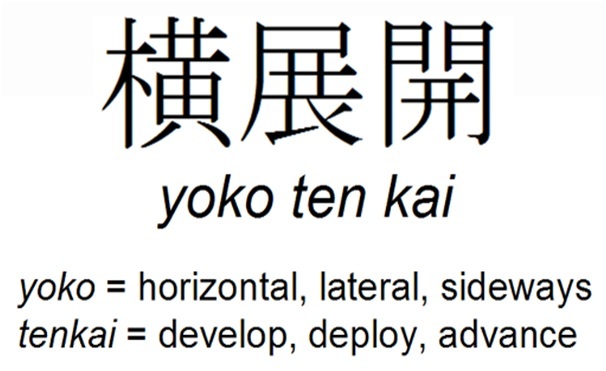 There is another Japanese phrase which is often associated with building a yokoten culture. It is kaze toushi ( 風通し ) and literally means “ventilation” or “wind blowing through” but refers to the openness or ease of communication within an organization. When this ventilation or information flow is poor, yokoten does not happen. Yokoten is a essential part of long-term success in a lean culture, but can also have a big impact on short-term results. Yokoten is a success multiplier. Perform a good kaizen, and then copy (adopt) the results, learn from it & adopt it wherever applicable, and you immediately duplicate or multiply the impact. The same is true of lean. There is no guarantee that it will continue on its own into the future. We need to exploit Yokoten to assure that we continue to be lean into the future. 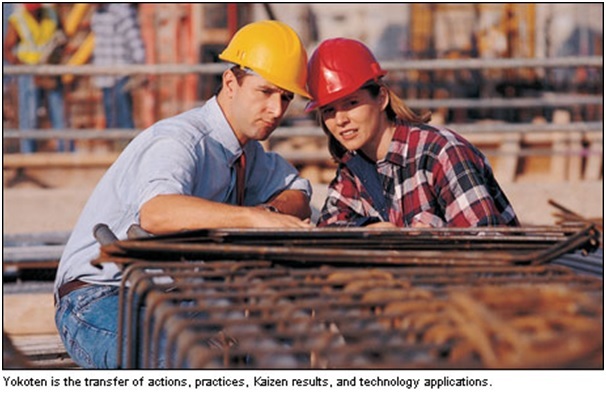 Categories: Article | Tags: Kaizen, Kaizen College, Kaizen Consultants, Kaizen Institute, Kaizen Institute India, Kaizen Simulation games, Kaizen training, Lean, Lean Consultants, Lean Consulting, Lean Manufacturing, Lean six sigma, Operational Excellence, Six sigma, Six Sigma Consultants, Toyota Business Practice, Toyota Production System, Yokoten | Permalink.